Whether you’ve served your market for 50+ years or if you’re the new guy in town, having a strong online presence surrounding your brand is a must these days. The question is how to do it strategically and cost-effectively. We help our clients dominate the search results page with an effective, lead-producing strategy that doesn’t leave you feeling like you lost an arm and a leg. Great rankings don’t have to be complex or costly – you just need a well thought out strategy that’s crafted for your business in your local market. 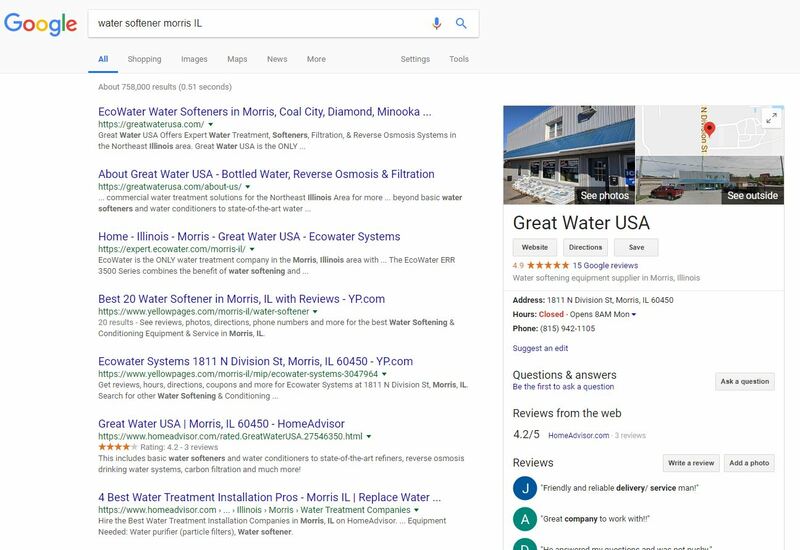 Check out this image of that showcases our client when “Water Softener Morris IL” is searched for. There’s no doubt that a person doing this search would literally have no option but to reach out to them! They’ve also been intentional about gathering good, quality reviews from local customers, which is a MUST for a strong local presence. To learn more about how our team of experts can help you reach your local market with search engine optimization and an ROI focused lead-gen strategy click the big button below.